The aim of this paper is to investigate the relationship between the manufacturing confidence indicator (CI) and the industrial production index (IPI) as well as to address the effects of the “Great Recession” on this relation. Some stylized facts about CI are firstly presented and the stability of the relationship in the framework of a linear model is subsequently explored. In addition, the findings are tested to be robust with respect to a “sample selection” effect in survey data and also to the hypothesis that they may suggest a change in the long-term trends in the industrial activity. 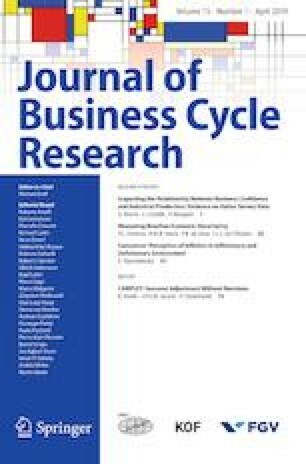 The empirical evidence shows that: (1) the change in the relationship may be due to some cyclical reasons, rather than structural ones; (2) the performance of CI is not affected by the different permanence of firms in the panel; (3) agents are likely to adjust their production plans during the financial crisis, considering a new lower benchmark for their industrial activity in the long term. In particular, as the capacity utilization that managers consider as “ideal/sufficient” is proven to be changed over time, this finding may be consistent with the presence of non-linearities in the relation between CI and IPI. The opinions expressed in this paper are solely the responsibility of the authors and should not be interpreted as reflecting the views of ISTAT or its staff. Helpful comments from the participants to the 33rd CIRET Conference held in Copenhagen in September 2016 are gratefully acknowledged. Usual disclaimers apply. Do you consider your current overall order books to be as high, normal, low? Do you consider your current stock of finished products to be as too large (above normal), adequate (normal for the season), too small ( below normal)? How do you expect your production to develop over the next 3 months? It will increase, remain unchanged, decrease? Considering your current order books and the expected change in demand over the coming months, how do you assess your current production capacity? It is more than sufficient, sufficient, not sufficient?